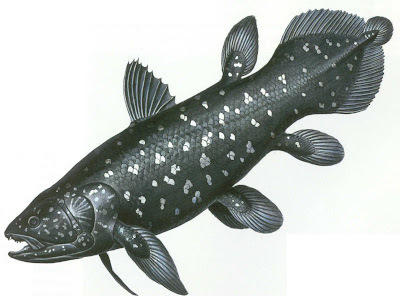 Past Remembering: The Coelacanth: "Living fossil?" 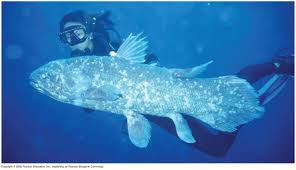 Let me introduce you to the Coelacanth, my personal candidate for the winner of the Most Repulsive Fish category. It is well represented in the fossil record. This fish was thought to be 400 Million years old --older than the dinosaurs--and to have gone extinct with the dinosaurs 65 million years ago (according to Darwinite uniformitarian materialists). 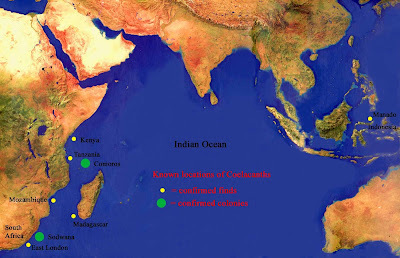 That is, until some western paleontologists were strolling through a Madagascan fish market and found one – freshly caught! Actually, it didn’t just appear. It had been alive all the time. It was known to the local fishermen, who could tell the stunned researchers that this fish could only be caught at a depth of 700 feet and only at night. Since then, many specimens have been caught, mainly off the island of Madagascar. It’s called a “living fossil” or “an evolutionary aberration.” What it really amounts to is another hole shot in the evolutionary propaganda by facts. One of the arguments between those who accept creation by God and materialists/evolutionists is whether man and dinosaur co-existed--and here we have man and pre-dinosaur (again according to evolution) co-existing. The point is that their theory doesn’t line up with the facts. In any other area of inquiry, the theory would be thrown out. The fact that so many people cling to it verifies that people want a world where God has no part in it. It does nothing to lend credence to the theory.